Listening and then talking are the two fundamental communicative developments in babies. Various studies rightly extoll the importance of ‘talk’ households and evidence the poor communication skills of children who do not have access to ‘rich talk’ daily. In an age where face-to face – and even earpiece-to-earpiece – talk has been replaced with screen talk, an understanding of talk intricacies such as tone and volume as emotional indicators are perhaps dying out. 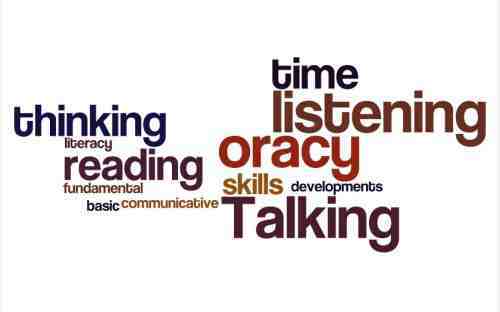 Nonetheless, I believe that there will always be the need for these two basic oracy skils; listening and talking to each other will forever remain an integral part of human interaction. And whilst we might – rightly or wrongly – assume that these skills are being developed continually, as I pointed out earlier, we have to remember that not all children have the same access to ‘rich talk’ on a regular basis. It can be very difficult to develop listening skills in young people. They live in an ‘immediate’ culture where talking is far more important, listening is something you do quickly (or pretend to do!) and respond to even more quickly. I think that students would benefit from the implementation of wait or ‘thinking time’. Too often in lessons information and subsequent questions are delivered quickly and require an even quicker response. Students are given very little time to think about their own answer. ‘Think, pair, share’ is one popular method that can be built into lessons to ensure that students are given to do just that – think and then share their thoughts with their peer. This also helps students to develop skills in ‘turn taking’ such an integral part of our conversations with others. The introduction of mini-whiteboards upon which to note their musings can also prove to be useful. Students can then alter their ideas as they develop without committing to permanency of writing it in their exercise books. As teachers we have all undertaken CPD at one point or another about our ‘questioning’ skills. There are various methods and structures that can support our questioning, and ensure that students are stretched and challenged in our exchanges with them. And yet, do we give such thought to the training of our students in asking ‘good’ questions? Students would benefit from an understanding of how questions are constructed and which types of questions work best in certain situations. Such an understanding could help ensure that their exchanges with peers in the perennial ‘group work‘ situations that they must undertaken in every lesson of every day. After the reading of a text ask students what questions they would ask about the text and then develop a discussion around the quality of the questions they would ask e.g. why might a ‘what’ type question be asked ‘first’? As previously mentioned, group work is a relied upon teaching and learning strategy. Having observed countless lessons over the years, I have seen some effective and some ineffective approaches to structuring group work. What follows here are my ‘top tips’ on establishing effective group work. Always create your groups before the lesson. Yes, this might need to change with absence but not all of the students will be missing. Such forward planning will ensure that you have ‘balanced’ your groups effectively. Some schools use the Kagan learning structures which extoll the use of mixed ability groups and encourage a specific formation of students in four student groups. If this is not followed at your school, you will need to make decisions about the make up of your groups and whether your focus is on behaviour, challenge, support or something else. Making these decisions before the lesson will ensure that students are not given the opportunity to ‘group bargain’ with you. Be clear who they are working with through the use of ‘names post-it notes’ on the desk and stick to it – though of course if it doesn’t work or you want to ‘shake them up’ you can always move them around next lesson. Give everyone in the group a role. A former year 10 class of mine were not great at group work – they were often distracted and relied upon one group member to complete the task. That was until I introduced role cards. Each member of the group received a role card – again chosen in advance of the lesson – detailing their part in the group work. Some examples of these roles included group leader – responsible for the completion of the task in the allotted time, penalty given if not complete; scribe – the writer who had to make sense of the suggestions in writing; the questioner – someone who asked questions of the ideas – the ‘devil’s advocate’ so to speak. The role card also contained question stems and words/phrases that the student in that role might need to use. I have also used the ‘DeBono’s Hat’ structure successfully, particularly when students are asked to respond to a non-fiction text or a topic for debate. Again each student is given a role -here a hat colour (and literally a hat in that colour in some classrooms!) – and asked to consider the topic from that viewpoint. The breadth of thinking provided through the hats ensures complete coverage of all angles. Clear and relevant task. Asking students to ‘talk about’ a topic can lead to all sorts of random outcomes and ideas. Sometimes this is exactly what you want as a teacher and therefore there is nothing wrong with such a loose task. However, in most cases time is so tight that the discussion needs to be more directed. Ensure in this instance that students have clear guidelines about what areas to talk about and what you want the outcome of the discussion to be. Time limit. Students need to know how long they’ve got. No time limit is an invitation to discuss what was T.V last night and what they’ve got in their lunchbox. Be tight on time. Model the listening and questioning skills that you want them to adopt. There is no question that if students are ‘taught’ to listen and talk then not only will their learning develop but also their social skills, levels of empathy and confidence. These are skills for life, not just for group work. ← Computational thinking should ensure technology improves learning outcomes.